I acquired a taste for this on this trip to Taipei. The Taiwanese sure know how to grill their sausages. Not only do they do it just right, the more creative ones serve it up with an assortment of whatever you want – pepper, mustard, chopped onions, Chinese parsley, satay sauce – you name it, they have it. My favourite combi – Chinese parsley with hot sauce. 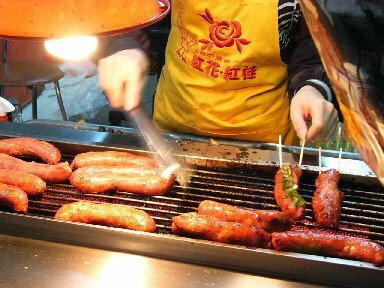 These sausage stands can be found at the night markets.